For Geocachers: there is cache around here. 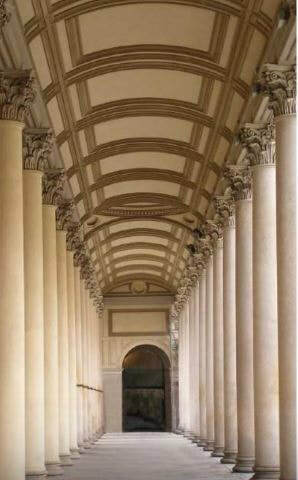 The hint is "read something about it"
The Duomo of Novara, also known as St. Mary of the Assumption Cathedral, is an imposing Neoclassical building designed by Alessandro Antonelli and built in the second half of the 1800s. It’s located on the site of the old Romanesque cathedral, that had already been partially refashioned during the 18th century. Further renovations began in the 1830s during favorable economic times. The building has three naves, divided by ochre-colored stucco columns. The altar was designed by architect Alessandro Antonelli, who at the time was only 34, and was built starting from 1832 and 1836; it’s made of 377 blocks of marble coming from quarries located in Verona, Carrara and Varallo. 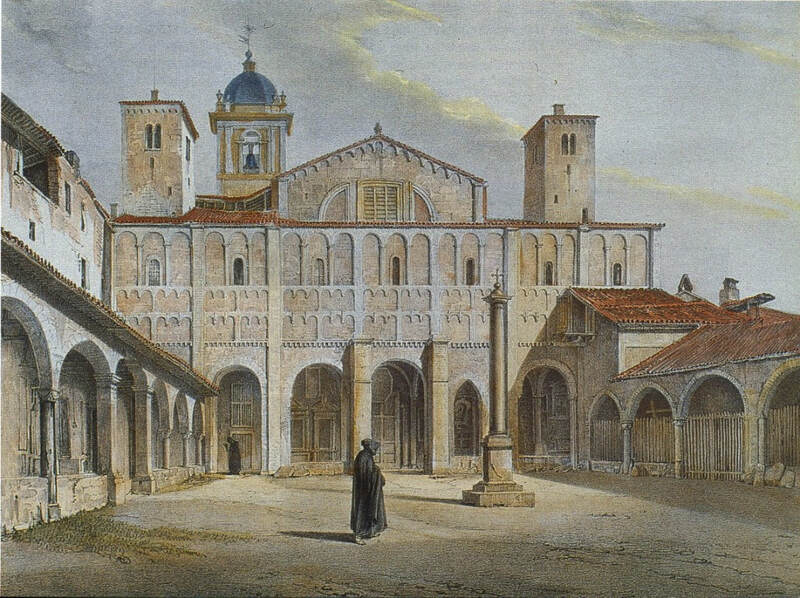 The result was so impressive that Antonelli was granted the possibility to demolishing the old cathedral and its portico in order to build the new one. ​Demolition began in the late 1850s, and continued in the early 1860s. The only Medieval elements spared from destruction are a handful of religious ornaments, a few paintings, the chapel dedicated to Saint Syrus of Pavia, the body of the bell tower, and a portion of the floor mosaic. 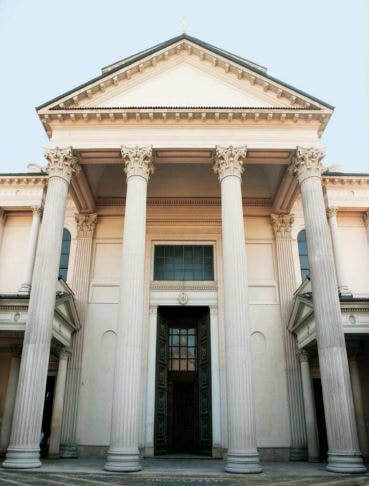 ​The new building has a colonnade overlooking the square, and the façade with four imposing fluted Corinthian columns that support the pediment. 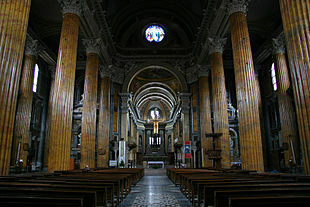 The altars flanking the naves were built during the 1880s according to Antonelli’s design. For the construction of the Duomo (as well as for the Cupola and Casa Bossi), architect Alessandro Antonelli used bricks, which are used with extreme skill by the designer, exploiting their high potential, but wisely hiding them from the eyes of the visitors. Opposite the façade of the Cathedral you can admire the ancient Romanesque Baptistery, which survived the Neoclassical restorations. 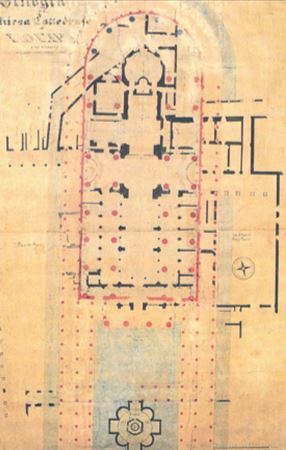 QUESTION 10​ - Go back to the print showing the Duomo before Antonelli’s intervention and compare it to the present building. 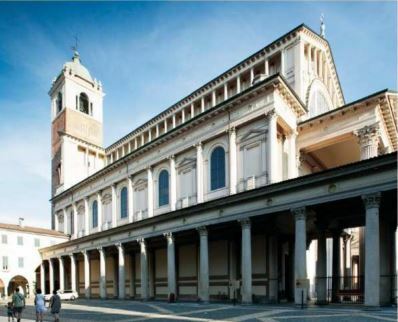 Which element did Antonelli use to give the new building a sense of height, lightness and majesty altogether (also connecting the church to the square and its colonnade)? 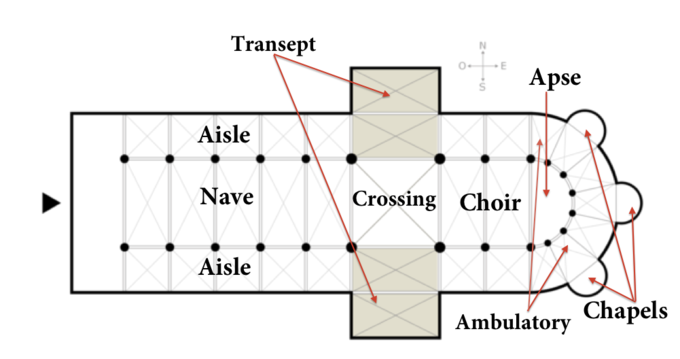 QUESTION 11 - Which element in the front part of the church has been inspired by Greek architecture? 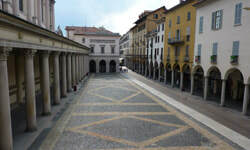 To the Western side of the piazza you can see the Guardhouse.